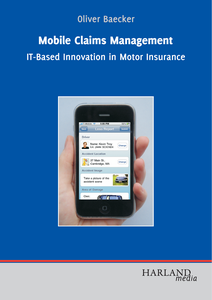 In this book, Oliver Baecker shows how mobile technology can innovate claims management in the motor insurance industry. The author investigates the potential of mobile technology to design value-added customer services as well as associated cost savings. Based on an analysis of today’s challenges in claims management business processes, he presents a service-oriented architecture that integrates mobile devices such as smartphones and cars with a commercial claims management enterprise system. The technical solution is evaluated using a methodological triangulation of in-depth expert interviews and a qualitative user study. A complementary business value analysis comprises the development of a business value model, the definition of business value metrics, and a business case calculator for an investment in mobile claims management. The book is addressed to managers and researchers with an interest in the application of mobile technology in the insurance industry.